Published on August 19, 2008 in Uncategorized. 752 Commentshttp%3A%2F%2Ftrainfortopdollar.com%2Fpodcast-episode-5-online-fitness-coaching-software-solutions.htmlPodcast+Episode+%235%3A+Online+Fitness+Coaching+Software+Solutions2008-08-19+20%3A20%3A38Ben+Greenfieldhttp%3A%2F%2Fwww.trainfortopdollar.com%2Ftrainfortopdollar%2F%3Fp%3D75 Tags: coaching online, fitness coaching, online personal training, online software, trainingpeaks, virtual training, web training. 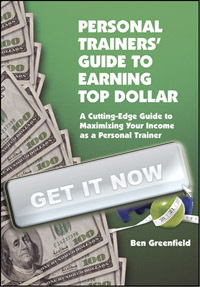 In this interview, Ben Greenfield talks with Training Peaks Chief Marketing Officer Dirk Friel about what features are available in online software programs, how many clients a trainer can work with, what type of legal considerations exist in the virtual training environment, and the practical aspects of how technology can significantly enhance a coach or trainer’s income.